PIT: The jolliest game ever invested for an informal good time. The game is based on the exciting scenes of the American Corn Exchange, usually styled the 'Wheat Pit'. There are nine cards each of Wheat, Corn, Barley, Hay, Rye, Flax and Oats. The idea is to obtain, by trading, all nine cards of any one kind. If you do this, you have a 'Corner' and a corresponding number of points. The game is won by the first trader getting 500 points. This is a brilliant and complete example of a very popular vintage card game. The box is in excellent condition and each of the 65 cards presents itself in mint condition. The rule booklet and rule sheet are likewise in excellent condition. We are confident that this game has never actually been played. 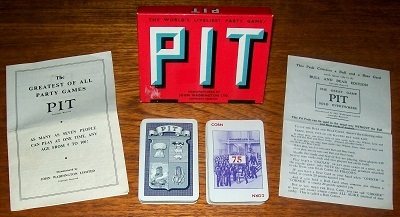 This version contains a Bull Card and a Bear Card, which only appear in the Bull and Bear Edition of Pit.